Isa Vásquez provides support to the education faculty development programs, managing logistics and producing print, audio, video, and web resources for teacher participants. Other contributions to the Project include bookkeeping/administration, support for online projects, American Social History Podcasts, the education database, and HERB. Isa taught mathematics and logic for the GED at the Adult Learning Center at Hostos Community College, and facilitates the Model City Council project administered by the Edward T. Rogowsky Internship Program in Government and Public Affairs. 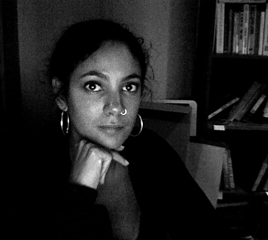 Isa is in the Ph.D. program in Political Science at the CUNY Graduate Center, with a focus on urban policy, criminal justice, and neoliberal theory.